We rebranded global wealth management company Gold and Silver Investments as GoldCore. The new visual identity is more suited to their vision of becoming the top gold bullion investment company worldwide. It gave us the perfect opportunity to use the product offering, gold, and create an identity and language which was completely suited to the market they occupied, suave, sophisticated and serious. 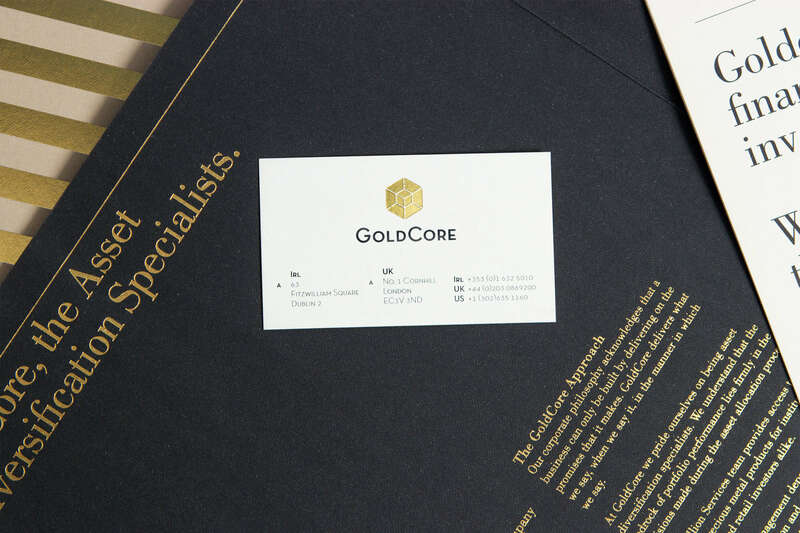 The use of gold foil, minimal colours and classic quotes which allude to the significance of gold in a wealth investment plan, helped put GoldCore firmly on the international stage. The hexagonal shape of the GoldCore logo comes from the unusual atomic configuration of the smallest piece of 24 carat gold possible. The project included all brand collateral and brochureware.